So I am a Wrangler owner. Strange thing being a Cult of the Wrangler member (de facto). I have other Jeep Wrangler owners waving to me. Now, I knew rationally and factually that this does exist but I have experienced it, which is a different thing. In the last eight days I have had or fifteen Wrangler owners wave at me. Two today. I am really liking the darned thing. Yes, it will kill me if I do not exercise control and daydreaming is not encouraged. Ok, I can deal with that. It is like riding a horse that is a real spirited d*ckhead of a horse. I always wondered what it might be like to be adrift, and always wondered how you ensure your survival. Well, you don’t. 99 times out of a hundred, I guess you die. The Life of Pi would seem to be a bit rosy if anything. Again, thanks to Cracked.com, now I have a better understanding of post-apocalypse. Good heavens… What keeps them on? Glue? My guess is the condom is mostly effective because the users would develop an aversion to genital pain. Let us all thank a hacker today for moon footage. Yes, evil walks the world. Baby killers.. You do not experiment on the innocent. You try things out on a case by case basis to save a life, but not like this. I read in Drudge today a link to an interesting article. Smart PJs are storytelling pajamas, that use mobile technology, similar to a QR code, to display bedtime favorites on a smartphone or tablet. Now, read the next section carefully. The bedtime stories are contained in the polka dots on the child’s pajamas, which are available in pink or blue. “You scan one of those dot patterns on the kid’s pajamas – there are 47 different ones – and each one of those dot patterns is a bedtime story,” says Murdoch. To choose a story, parent or child launches the Smart PJs Stories app (free, in Apple Store for iOS, or Google Play for Android), and holds the device’s camera over the dot patterns. “You take the picture, and it automatically launches the story,” Murdoch says. Murdoch says most of the stories contained in the app are in the public domain. Murdoch hired voice actors and artists to record the stories and illustrate the slides that correspond with the story. Catch that? Go read Neal Stephenson’s book The Diamond Age. The story by Stephenson is about nanotechnology, where actors (re-actors) are hired to interact with people by acting out roles, and they have nanites embedded in their skin so their real faces can be captured digitally, and the customer can have whatever they want, provided the ractor is paid enough to do it. Actual live meatspace interaction need never happen. A nano-designer is asked to create a bespoke device called “The Young Lady’s Illustrated Primer” and then destroy the design. It was to be made for a rich man’s grand-daughter or niece as one of a kind but is stolen and ends up with a poor neglected girl named Nell, who is essentially raised by a ractor who begins to care for her as if Nell were her own daughter. But the overarching story is that with nanologic or a sufficiently advanced Turing machine, one could raise a child using one of these devices whether or not there was a ractor. Maybe. The question the book leaves is: Is it good enough or is it better than nothing if it is not as good as the real thing? It is at once a heartwarming story, a breathtakingly sad story, and a cautionary story. And worth every penny. The second and third possibilities (sad and cautionary) are totally do-able, and the first can only come from someone who loves the kid. How can one do that, make a connection, by letting a device read a story to one’s kid? Note: Full and honest disclosure requires me to state that I am a total fanboy of Stephenson’s, so my bias should be noted. “The Diamond Age” is a must-read, regardless. Then go read “Snow Crash”, “Zodiac”, and “Cryptonomicon”. Well, since it is a serious post anyway, I would bring this up – who knew that Hitchcock would have done a documentary on the Holocaust? Too many people have forgotten, I think. Sorry for the serious turn tonight. Man takes dive in snow challenge. Heard about this today from The Butcher of Lansing. I may have done a global warming dance in the snow barefoot but the skin of my feet is a lot tougher than my mini-me’s skin. Talk about a life-changing lapse of common sense. To graph is to breathe. 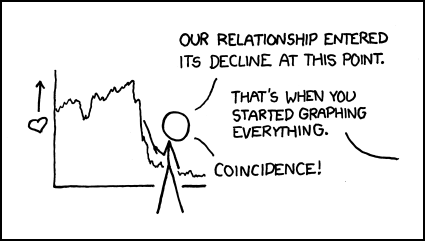 Correlation can imply causation now and then. It should be noted that if one does a linear regression on a graph of frequency of divorce vs. frequency of graphing things in marriage, the correlation coefficient is r = 0.87, where 5 graphs per day in a relationship leads, ultimately, to a messy divorce involving multiple lawyers, blunt character assassinations, and the sacrificing of many small animals. I am declining to post the graph in order to maximize my odds of that never happening. We just got back from seeing a matinee showing of The Hobbit, Lemurita and I. It was fun. She only jumped and said “Ew” twice, once when she spilled Orange Crush on herself. Lemurita and I both felt that the giant eagles totally Roc’ed. Hackerboy and Cruel Wife stayed at home and played Lego Harry Potter. h/t to The Dude for passing on this pic of the day. This has been in my “to-do” box for some time. It’s a mention of how life has been… unfair… to Gen Y’ers. See, apparently someone along the way promised them puppies, unicorns, moonbeams, Hope and Charge, and all of the perks to be found at Big Rock Candy Mountain. Eighteen months and two busted jobs later, the daughter of a retired physician and a former editor at Vogue circled back to upstate New York and hunkered down at a small legal office that pays about one-quarter of her former $165,000 salary. Hey, life is hard. I was laid off a day after our honeymoon ended, eight months later moved across country away from family and friends, and found/took a job making peanuts after losing most everything we had. If she was making $165,ooo a year, why the hell doesn’t she have a huge savings account stuffed with dough? Generation Y professionals entering the workforce are finding careers that once were gateways to high pay and upwardly mobile lives turning into detours and dead ends. Average incomes for individuals ages 25 to 34 have fallen 8 percent, double the adult population’s total drop, since the recession began in December 2007. Their unemployment rate remains stuck one-half to 1 percentage point above the national figure. So, life gives you some hard knocks and just years later the conclusion is that the American Dream has faded? Geez, grow some… brains. Wherever did the American Dream promise success? “This generation will be permanently depressed and will be on a lower path of income for probably all of their life — and at least the next 10 years,” says Rutgers professor Cliff Zukin, a senior research fellow at the university’s John J. Heldrich Center for Workforce Development. Professionals who start out in jobs other than their first choice tend to stay on the alternative path, earning less than they would have otherwise while becoming less likely to start over again later in preferred fields, Zukin says. Guess what? The world is populated by people who to a huge extent have lives that weren’t their first choice. The legacy given by boomer parents has been comprised mostly of piss-poor assessment of reality. Bear with this posting there’s some good nuggets of gold in it. First, enjoy a kitten. Sure she’s not quantum tunneling at the moment but she just had her shots. 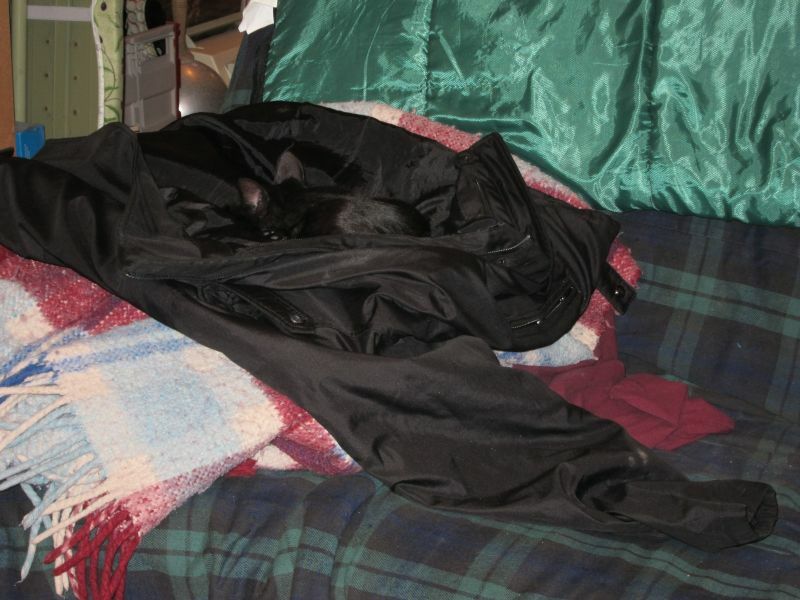 I walked by her three times w/o noticing her because she blends into my jacket. She was not phasing in and out but she was running about 3 degrees above normal. Sheesh. Like electricity is that dangerous. It’s not like it has ever killed anyone or set fires or anything. Next, enjoy some redneck wallpapering. 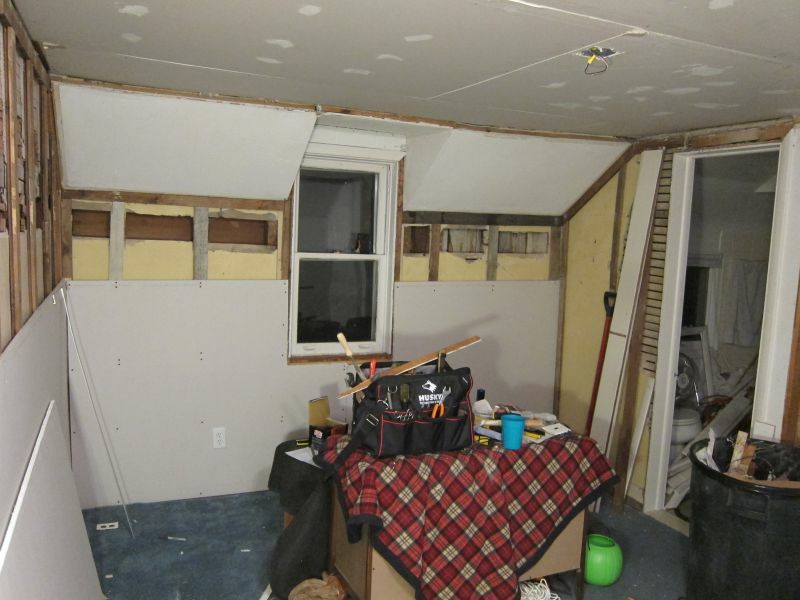 In the oldest part I cut out plaster and lath so we could get insulation in the walls. 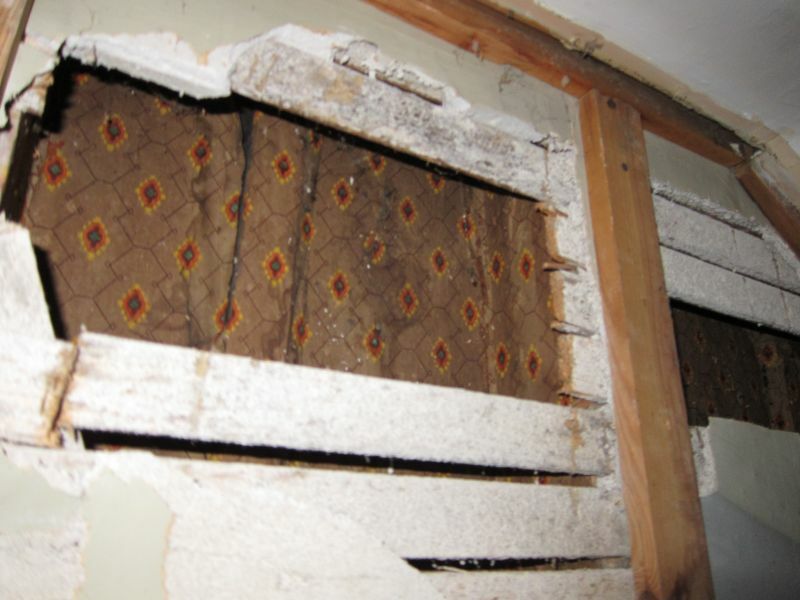 Notice the wallpaper on the inside face of the outside wall, including the joists. This sucker was an open wall and left long enough that wallpaper was deemed a good thing. It’s like a bad episode of Redneck Rampage™. It truly is as if a layer of purty paper protected these folks from whistling cold Michigan winters. None of this is designed to gain back readers such as Mitchell and veeshir, who are at this moment boycotting this blog because my retrieval of their remarks from Spam Hell is not quite fast enough. Ask Cruel Wife if I am busy enough lately. For grins, look at a mirror that I showed Cruel Wife at my company. I simply call it “My Precious”. Won’t tell you who made it, who they made it for, it’s exact specs, etc. 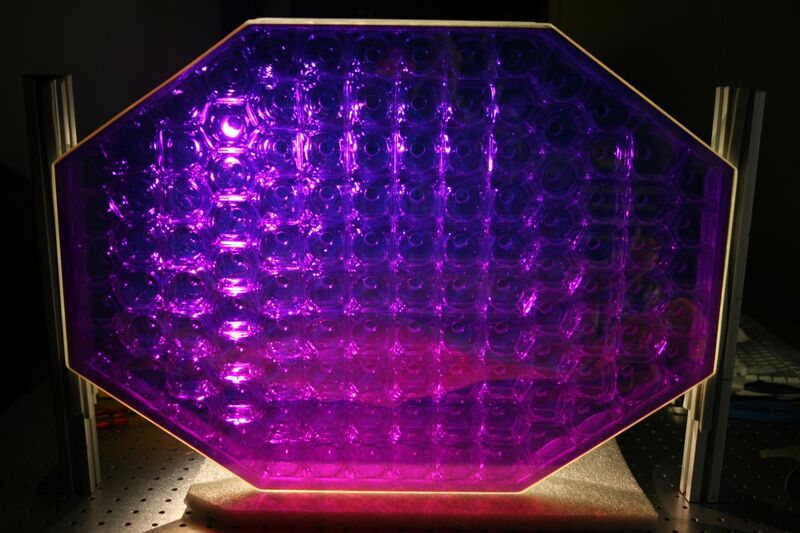 I will say it is 24″ x 18″ x 3″ thick, flat, honeycomb inner construction, and coated for multiple wavelengths. 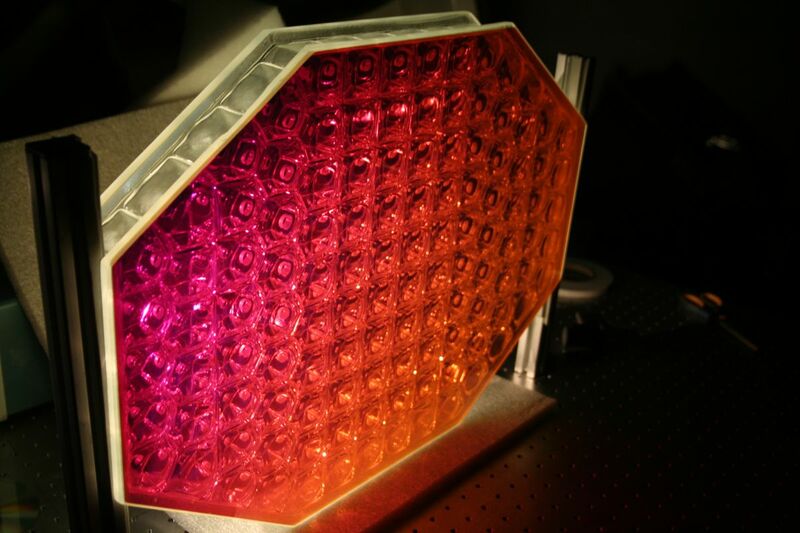 All pictures were taken using while light back illumination but at different angles to the surface. 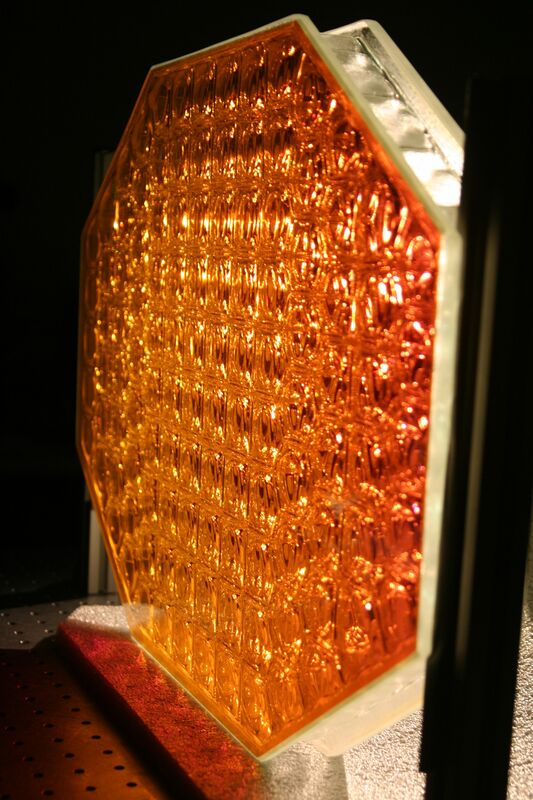 Same piece but a dielectric Reflectivity enhancement coating looks very different from all angles. It’s complicated. So a co-worker gets ahold of the pics I took, fires up his copy of PhotoShop (Gimp, truth be told) and tweaks it… now My Precious is truly one mirror to rule them all. Lemurita just watched LotR with me Sunday night, saw that last image and laughed and laughed and laughed. That’s my girl. Much work has been done. 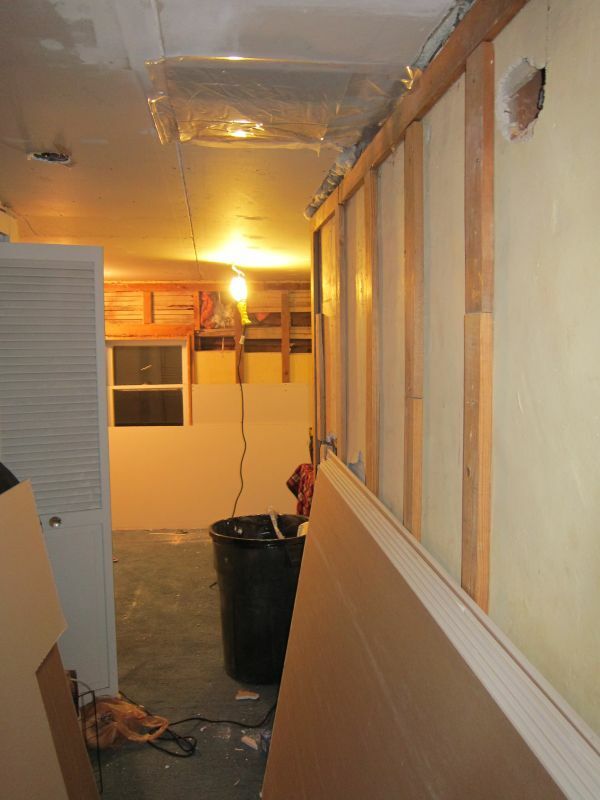 Walls have been torn down, electrification has been improved, half-walls of sheetrock has gone up, and we merely wait to fill the walls this weekend with light and fluffy gossamer down, mixed with goose feathers from foie gras geese and leftover fur from clubbed harp seals. In the meantime, the kitten is growing, and she is a delightful little lady. Kids are good and my daughter is displaying a wicked sense of sarcasm – AND – she watched LOtTR with me. Pics tomorrownig of the remodel, of the kitten, and of a giant mirror (my precious). Election year 2012 is past it’s due date. It’s like contemplating eating c-rations from WWII. Speaking of past it’s shelf life – here’s an older story but can you really put a expiration date on “weird”? From the endless Coffers of Trivia belonging to Black Lab on Methamphetamines I give you… goldfish with tattoos. Yes. Goldfish with tattoos. This one will never get old unless you live in India and have to put up with puppies inside your body. Thank you, FARK. And it persists even though it’s likely that not one person has seen another give birth to a litter of puppies. Maybe it’s a social taboo to witness your neighbor’s puppy-squeezings. Ever since Al Capone’s Vaults, Geraldo Rivera has an approval rating from me that ranges well south of zero. Well, a small instrument I had a hand in has gotten a new lease on life due to an extension of it’s parent craft’s mission – MESSENGER has been so frugal and reliable that they’re going beyond the original mission duration. It’s not going to be crashed on Mercury just yet. But that day will come (thought to be next year). This is a spacecraft that has been in-transit from Earth since 2004, has orbited Mercury while being baked from the sun-side (big heat shield) and from the backside (Mercury is hot, damn hot). In fact, the spacecraft is exposed to enough heat that the nice highly-elliptical orbit allows it to cool a bit. Radiation, thermal cycling, deep space, launch (they are very violent)… and it is still working. Kudos to the mission scientists and systems engineers. The latest findings are presented in two papers published online in Science Express today, and in 57 papers presented this week at the 43rd Lunar and Planetary Science Conference in The Woodlands, Texas. Team members at the meeting will also preview MESSENGER’s extended mission, set to run to March 2013. The event, scheduled for 12:30 p.m. CDT (1:30 p.m. EDT), will be streamed live on the Web at http://www.livestream.com/lpsc2012. Presentation materials are available online at http://messenger.jhuapl.edu/news_room/presscon11.html. Ice on a 800 degree planet? Heck yeah. In a vacuum, too. Next we’ll find that they’ve spotted sharks with lasers on their heads. Equally fantastic. The MESSENGER team has launched a free app that brings you inside NASA’s history-making study of Mercury – the first images of the entire planet, along with the detailed data on Mercury’s surface, geologic history, thin atmosphere, and active magnetosphere that MESSENGER sends back every day. Now available in the iTunes App Store, “MESSENGER: NASA’s Mission to Mercury” brings users the latest news and pictures from the mission, as well as details on the spacecraft and science instruments, and offers access to educational programs and activities. I was going to do a rant on racism – and how those who cry against it suffer from it as well – but I don’t have the energy to entertain the blatant hypocrisy of the last week at this time. Maybe later. Note: I apologize for putting this in such close proximity to the Furrier Transform (Fourier Transform of a Cat) posting from yesterday, but I’ve actually been studying this thing for a week, and having massive geekgasm after massive geekgasm. A plan? A Planimeter, that is. While doing research for another Dr. Lemur graphic I was poring over photo after photo of old steam locomotive drive linkages. It was then that I stumbled upon an instrument that (honestly) I had never heard of but the old Slide Rule crowd all seem to know quite well, the Planimeter. Three moving parts. The first pivot which can pretty much go wherever you want it is linked to an elbow of sorts, and connects to a second arm that has two things attached to it – a tracing stylus and a wheel that has graduations on it. That’s it. Simple. You can make one out of Tinkertoys™. Why, it pretty much directly reads out the area within any arbitrary shape you can draw. And here I thought that there used to be some crazy fellas in a basement calculating areas within a bound shape via brute force Riemann Sum methods (in 2-D, of course). But one does not have to do that. Think about that… two moving arms, a sharp stylus to travel around the outside of the shape you want to integrate in 2-D, and a wheel that tells you directly what said area is when you’ve traversed one circuit – but part of the time going along the curve C, the wheel turns, and part of the time it does not, but it still works. The math is really… mathy. The polar planimeter as shown above is easier to follow (if not easier to derive) but the linear planimeter math is cooler because it does a line integral thing. I asked the resident mathy-guy, who I shall call DocJ, ran me through Green’s Theorem when I showed this to him and he walked me through why this thing works and if anything it was even cooler. On a flight she took from College Station to Houston in October of 2009, Colleen O’Neal says the turbulence was so bad as a result of the weather the plane banked from side to side and made dead drops in the sky as though it were losing power. O’Neal is now suing United/Continental and few other airlines in charge of the flight because she can no longer fly as part of her job, as the trip gave her Post Traumatic Stress Disorder. “This does not just affect my ability to get on an airplane, there have been times when I’ve been driving down the road and I hit a pot hole and I have to pull over because I’m having a flash back,” she says. Lady, you’ve got more problems than PTSD. It’s been a while since I read so much utter whinging as here at the Business Insider. And, by the way, few people would have a problem with inequality if the American Dream were still fully intact—if it were easy to work your way into that top 1%. But, unfortunately, social mobility in this country is also near an all-time low. So what does all this mean in terms of net worth? Well, for starters, it means that the top 1% of Americans own 42% of the financial wealth in this country. The top 5%, meanwhile, own nearly 70%. Ok, stay with me on this one. I have just one question: So what? This is really a lot like screaming “There are DUCKS in the POND!! !” hysterically. Is anyone surprised? Is it a crime against nature or just something you’d naturally expect could happen? Is there some rule regarding this that is writ in stone? That’s about 60% of the net worth of the country held by the top 5%. Good God, you utter bastards. How dare you own more than others? Have you no shame? And remember that huge debt problem we have—with hundreds of millions of Americans indebted up to their eyeballs? Well, the top 1% doesn’t have that problem. They only own 5% of the country’s debt. Let us take a moment from the madness to breathe into the paper bag of rationality. The average savings rate of Americans has been something around 1%. I’m not claiming causation or correlation here, but are the two somehow linked possibly because of the soundness of judgment of the average individual? Just sayin’. Pinellas County Sheriff’s deputies say a 22-year-old man accidentally shot himself in the head while showing his girlfriend a handgun. Deputies say Chaz Ursomanno was taken to Bay Front Medical Center early Thursday with life-threatening injuries. According to an incident report, 24-year-old Naomi Ensell told her boyfriend to put the gun away about 2 a.m. Thursday. But he told her it was safe and put the gun to his head and pulled the trigger. The gun did not fire. Deputies say he put the gun to his head and pulled the trigger again. This time, it went off. The man was unconscious when deputies arrived. This is going to sound stone cold, but please tell me he didn’t reproduce. In AP-speak apparently, “unconscious” really means “dead”. This is a fantastic idea, because if anything shouts “do me”, it’s a 300m deep structure built into what is basically a city build on a lakebed in a highly volcanically seismic area. It’s like watching a redneck doing a Fourth of July celebration at a refinery. Yes, organic bloated roadkill is much healthier than dirty animals at a farm. Man avoids supermarket meat for 30 years by eating roadkill.